BACKGROUND: Complex laparoscopic tasks are nearly impossible to complete when the telescope is pointed toward the operator (paradoxical image). Attempts at image manipulation have been reported, but altered monitor displays may introduce even more confusion. The availability of high-quality, lightweight head-mounted displays (HMD) now allows individualization of the laparoscopic image. We sought to demonstrate that manipulation of the image can improve task performance in suboptimal conditions. STUDY DESIGN: 15 surgical residents (PGY levels 1 to 5) were timed while performing the standard “bead pass” skill from the Fundamentals of Laparoscopic Surgery (FLS) course. 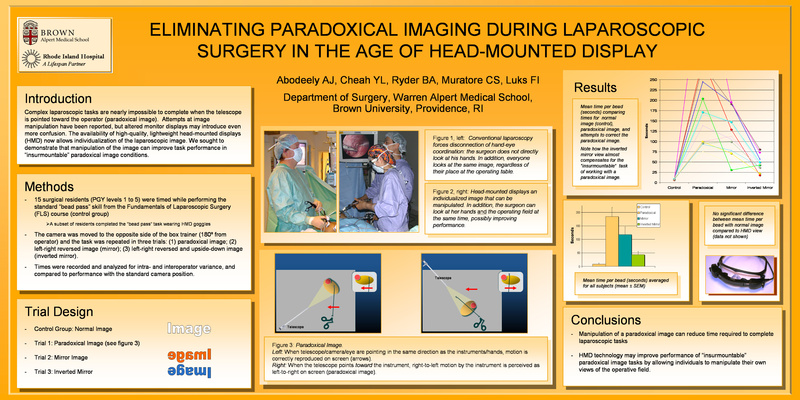 In experiment A, image display was either overhead (classic laparoscopy monitor position) or through HMD with wide vertical and lateral peripheral vision and full-VGA image quality. In experiment B, the camera was moved to the opposite side of the box trainer (180º from operator) and the task was repeated in three trials: (1) image as-is; (2) image left-right reversed (mirror); (3) image left-right reversed and upside-down (inverted mirror). The goal was to pass 6 beads. Times were recorded and analyzed for intra- and interoperator variance when compared to the standard camera position.